Well, I did it. I finished Foxe's Book of Martyrs as unpleasant as I found the task to be. So what did I think? I did think, that's for sure. I think I shall depart from my normal style of review and give you my thoughts in bullet point form. Hmmm. Thought #1: I know this book is on many a home schooled high school reading list and I'm not sure why. I recognize that this is a piece of Christian history. But if the modern thought towards reading this book is to make Christians feel grateful for the freedoms that they have today (at least in America and even then the freedoms are fading with apathy) then I'm still not sure why they would have to read this book. Seriously. It's vulgar in the gory sense of the word. Might as well watch Braveheart or The Patriot and watch some heads roll. At least its only a brief moment on screen. I do not find it educational to know which body parts of Martyr #102 (making up a number) fell off in the fire first and/or in what order. Thanks. Foxe's could have ended almost every story by saying, "And they died a horrible death." and I would have been satisfied. Truly. Thought #3 - Who WAS John Foxe's and how did he escape persecution during the very time frame that he was writing about? (I always wait to research the book and author until after I'm done reading the book. It's my long standing habit as I like to see if I can correctly ascertain the writer's meaning and fancy before confirming anything about what I'm reading.) How did he escape the stake himself? He fled to Germany. I'm not sure yet what I think about this. Although I am glad to have a recorded history of the goings on and he had to leave England in order for us to possess this work. It's just so odd. You can find out more about him by reading here (longer version) and/or here (shorter version). Thought #4 (and then I'll conclude) - It is an important work and it is good for Christians to be aware of the history which birthed them in their present state. We could live our lives ignorant of the sacrifice of others but to do that is dishonorable and uncharitable. To hide your head in the sand when it comes to hearing about the sacrifice of someone else is selfishness. It is to say, "My comfort is more important." At the same time, it behooves the relater of history to do so in an accurate and tasteful manner. I'm not sure that I think Foxe's was tasteful, although I will choose to believe he was accurate. In poking around online I discovered that Foxe's Book of Martyrs was considered "second in importance only to the Bible" up until the 19th century. After that Foxe's was largely discredited as inaccurate. However a biography was written about him (published in 1940) that validated Foxe to some degree and the public interest in this work grew. So here we are. 2008. Worlds and lifetimes away from the 1500's which is the era of time that Foxe's focuses on the most. What have we learned? Freedom comes at a price. Christ Jesus paid the ultimate price for us. Some of His children are called to great sacrifice as well, and in many areas and ways. The Christian life is not an easy one. God never promised that we could "always be comfortable and happy when [we] put our trust in Him." You will not find that in the Bible. What you will find is a call to leave father and mother and personal comfort zones to follow after Him. People throughout history have had to make life altering choices when they have turned to Christ. It is a fact and we should be aware of it. Our lives are not our own. This book is useful in reminding you that freedom in Christ costs. It is a useful and good tool. I just don't think it's a "must read." It's a good thing but it is not for all. In other words, I'm glad to say that I'm finished with it. That is not to say that I'm glad I read it. Thanks for the review. I have to say, I haven't changed my mind. 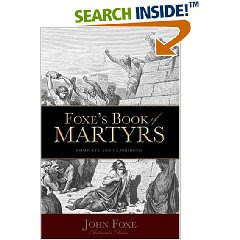 I still have no desire to read Foxe's Book of Martyrs... in fact I abhor anything gory... which this book has plenty... so I think I'll just know they all died horrible horrible deaths and thank God that He gives us the grace to handle what we must. 'Nuff said. I received this book as a present, and I'm glad I did. It's an important book. However, I've never really wanted to read it. Great review Carrie, as always. I sympathize with some of your points: Foxe seems to be making a Hollywood of sorts out of these martyrs with his grandiose verbiage. I do believe it is good to read lives of the saints before us, but I am wary of focusing too much on martyrdom. It is not some special merit badge Christians can earn. I know as a child I was read countless stories about missionaries who gave up everything and went to remote villages with the Gospel. I, and many other kids I'm sure, totally believed that was the way to truly server God, I mean, if you really loved Him. Staying in your home town, and being an honest business man and wife and parents was some lesser form of godliness. I felt similar after watching 'The Passion of the Christ.' Such a dwelling on the gore seems... prurient. Yet as you say, it makes the point that our freedom costs. A lot. Maybe there's a value in having my insulated existence broken through by books like this. But I do have a hard time with them, and have trouble getting the images out of my mind for a long time afterward. Great review. Thanks for your honesty. Just now reading this review in 2012. While Foxes Book of Martyrs may seem dramatic, one must remember the era in which it was written. Foxe wasn't writing in 21st century English. This style was expected for an author whose intended audience was very broad - the lower classes as well as those in nobility. We have reduced our language and style to "texting" bites and have little appreciation for the eloquence demanded of scholars of the 15th and 16th centuries. Regarding his exile to Germany, this was actually quite common. Why wouldn't he remove himself from danger? When reading works of history one must take into consideration the full context in which it is written and in which the author is living to appreciate its elements.